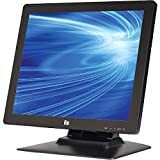 The Elo Touch Solutions 1523L 15-inch touch-monitor is well-suited to meet the durability and aesthetic requirements for a variety of high traffic retail and hospitality interactive solutions and includes options for 3-track Magnetic Stripe Reader (MSR), webcam, RFID reader and brackets for mounting a 0700L rear facing customer display. iTouch Plus zero-bezel multi-touch surface acoustic wave (SAW) touchscreen technology provides stable “drift-free” operation with outstanding image clarity, resolution, and light transmission-for an accurate touch response and vivid images. iTouch Plus offers a unique, aesthetically-pleasing seamless design and is resistant to water, impacts, scratches and other contaminants on the screen. The 1523L has been “designed for touch” from the ground up, with such features as a spill-resistant sealing, adjustable height stand with tilting functionality, connectivity incorporated within the monitor, and communication cables and side controls with lockout capability. This entry was posted in Discount Computers and tagged 15'', 1523L, Black, Desktop, E394454, iTouch, LEDBacklit, Monitor, PLUS, Touchmonitors by Gadgets Manual. Bookmark the permalink.